Notice how in a bullish trend the RSI_Z is rejected by the red support line, while in a bearish trend the green line takes over this quality, but as resistance. So in a bullish trend the ricochet on the red line presents a buying opportunity and the touch without a cross of the green line is a chance to add shorts. 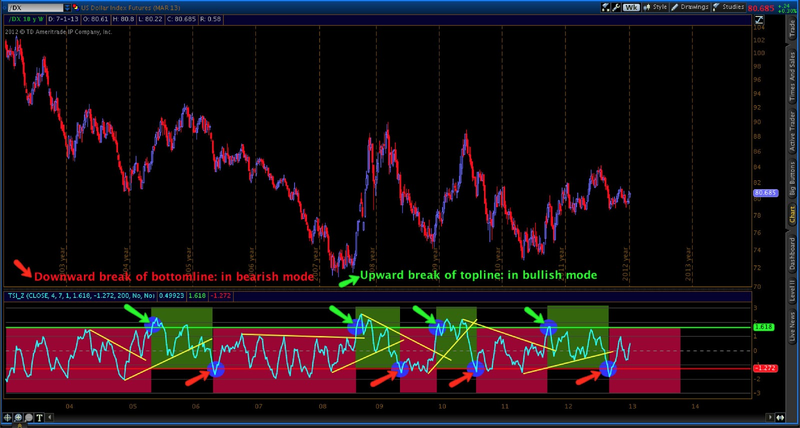 A change of trend is indicated by a break of the trend lines. 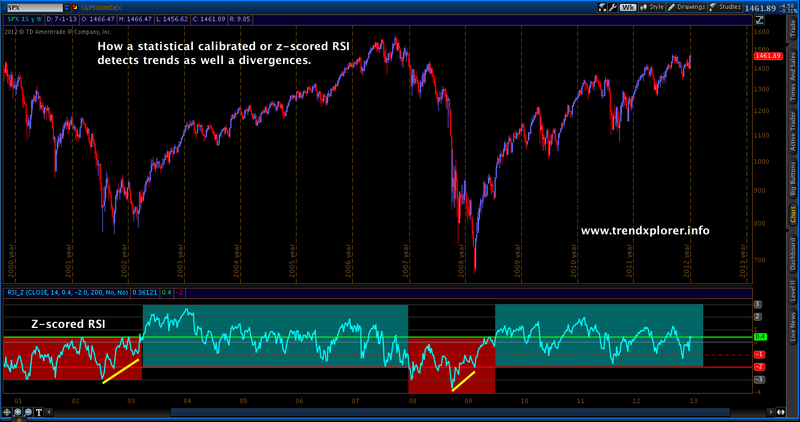 The same behavior is noticeable with another momentum oscillator, the True Strength Index or TSI. John Townsend aka theTSItrader has dedicated his blog to this technical instrument along with it's application on gold related stocks. Be sure to check out his blog, especially both his postings on various techniques for using the TSI. 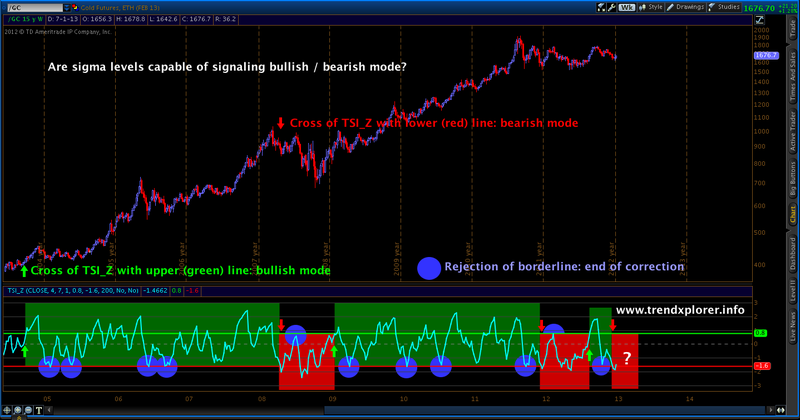 On the chart below however not the standard TSI is applied, but it's statistical normalized version: TSI_Z with John's favorite fast settings (4,7). 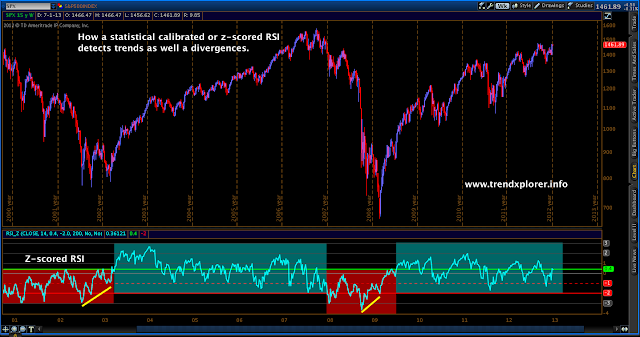 Again the sigma levels for support and resistance are manually calibrated by historical comparison. Next to the buying and selling opportunities offered by the break of the green line (up) or the red line (down), also the second chances for a bite at the cherry are shown (see the blue circles). The last example is a long term chart of the US$ index with the z-scored TSI (4,7) depicted along with one of the techniques John discovered: the trend line break. Any comment or suggestion to improve the indicators or their application would be much appreciated! Please take a look in the comment section below for the thinkscript code for the z-scored TSI. - mathematically there is no difference between the TSI settings (4,7) and (7,4). - new avatar: the golden spiral expresses my preference for Fibonacci numbers.